Today is Travis’ birthday (whoops – do I have to wish him a Happy Birthday on Facebook, too?) and he turns a whopping 5-years older than I am today. I don’t think he’d appreciate me advertising his age on the internet. Even if it probably IS on Facebook. I’d show you a picture of a fancy birthday cake or delicious meal or something, but there isn’t one. Travis has chosen to spend his birthday judging the America’s Finest City homebrew competition; I will be checking out the Food Truck gathering at 57 Degrees (at least until I am fed, cold, and wet). We’ll head out this weekend to do some celebrating. I could also wax poetically about how he is the love of my life, the key to my happiness, and all that is right with the world. Not to say he isn’t, but it just sounds weird to say it like that. In less than two months, I’ll be marrying a man who defies my expectations of how relationships should be. There are days when I surprise myself with my snippiness, and all he does is pat my head and make me eat something so I’ll stop being cranky. You might think it odd that we have so many love-language and marriage-communication books in our house, but I’m comforted by them. It tells me he acknowledges that relationships take work and that he’s more than happy to do the work that will keep us both happy (for the record, I’m happy to do it, too.) He lets me whine and complain and be stressed out. He lets the cat sleep on his head, but also points out the scratch he endured as she “kneaded” herself to sleep. Sometimes, he does the dishes even when he was the one to cook. I am very lucky to be loved by such a wonderful guy. And I do my best to make sure he knows that I love him completely. For Valentine’s Day, we got all meat-smoky with Korean bbq on Sunday and then I made dinner at home on Monday. 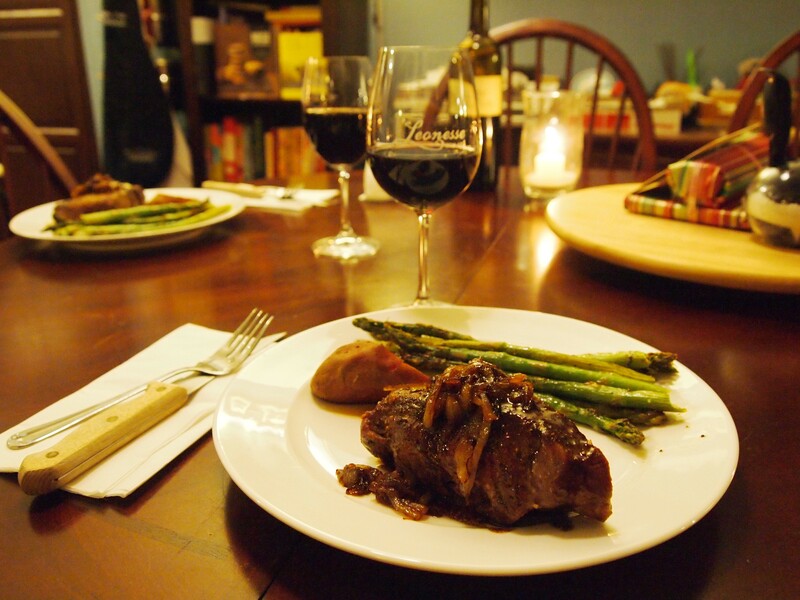 A good filet, some roasted asparagus, and a bottle of wine from the “good wine” fridge (see above photo). I bought him a flat-plug extension cord; I got my annual mixed CD. We celebrate V-Day, because it’s just what you do. But we’ll celebrate his birthday until we get tired of doing fun things. Just wait and see how long I extend the pre- and post-wedding celebrations! This entry was posted in about, food. Bookmark the permalink. Honestly, I clicked on the link expecting to see Hugh Jackman. But this post made me teary-eyed. Happy Birthday future-Mr. Three Dog Kitchen! Hee hee! I just watched Hugh Jackman in Wolverine… it was on tv a couple of night ago. But, no – I hear he’s still happily married. Aww, how sweet! Jake is also 5 years older then me. I like “older” men. haha. Hope you and the future hubby enjoys the birthday celebrations!